RICHARD NOWAK FINE ART: Alex Romero's Painting from my Acrylic Painting Workshop at the West Springfield Michaels last Sunday. I had 5 students including Alex and his daughter Lexi who both did great!! Fine oil, acrylic and watercolor paintings! Landscapes, marine scenes, garden scenes and still lifes. Painted in a realistic style with an impressionistic flair! Also, pictures of paintings from my students at Westfield Creative Arts in Westfield, MA where I teach acrylic painting. 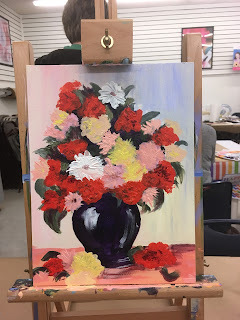 Alex Romero's Painting from my Acrylic Painting Workshop at the West Springfield Michaels last Sunday. I had 5 students including Alex and his daughter Lexi who both did great!! Thinking of Hawaii! Watercolor Paintings!! Below are my paintings on display at the rennovated Rinnova Gallery in the Rinnova Building, 105 Elm Street, Westfield. Most of the gallery instructors have been asked to display some of their works. I have the five below which illustrate my textured oil painting technique. Open to be seen when the gallery is open. Please check the website at www.westfieldcreativearts.com for info. Bridge of Flowers, oil on canvas, 5" x 7"
Teaching acrylic painting at Westfield Creative Arts! Great Fun Teaching!! Click on picture to go to their site! Painting last summer on location in Maine! Sold painting to a lady driving by! Doing an acrylic demo at a Westfield show! Doing a demonstration a few years ago! Great Fun!! Painting in a garden! !